As four days of “fruitful” and “useful” expert-level talks between Iran and the six world powers known collectively as the P5+1 (Britain, China, France, Russia, the United States and Germany) wrap up in New York City, and the next round of ministerial negotiations continue in Vienna next week, all Iranian eyes are trained intently on this summer’s international battle of grit, determination, and national pride. No, not the drafting of a final, comprehensive multilateral agreement intended to finally end the decades-long standoff over Iran’s nuclear program; rather, all attention has turned to the quadrennial FIFA World Cup, held this June and July in Brazil. Iran’s national team, Team Melli, is finally returning to the prestigious competition after failing to qualifying for the 2010 tournament, and with high hopes. Team Melli is currently ranked 37 in the world and will face Argentina (7), Bosnia-Herzegovina (25), and Nigeria (44) in the round-robin group stage. Midfielder Ashkan Dejagah, who plays for Fulham in the English Premiership, recently predicted in the Iranian press that Team Melli will defeat Nigeria and Bosnia to advance past the first round alongside group favorite Argentina. Coached by the renowned Portuguese manager Carlos Queiroz, Team Melli’s 28-man squad will most likely include 27-year-old California-born Steven “Mehrdad” Beitashour, a former Major League Soccer All-Star who is now a defender for the Vancouver Whitecaps. ”It’s the biggest stage and the best players [are] playing there. As a kid you dreamt about it,” Beitashour told the Los Angeles Times. “So having an opportunity to potentially be there, it’s just great.” The final lineup will be announced June 2nd. Team Melli’s history in the World Cup is a brief and unimpressive one; in only three appearances, the Iranians have never advanced to the second round. Despite hailing from a soccer-crazed country and boasting a number of international stars, some analysts are expecting a tough road ahead for Iran to qualify past the knockout round. That may be true aesthetically. But with just over a month to go before the kick off in Brazil, Team Melli’s fans are hoping their beloved squad’s chances of survival are not quite as critically endangered. 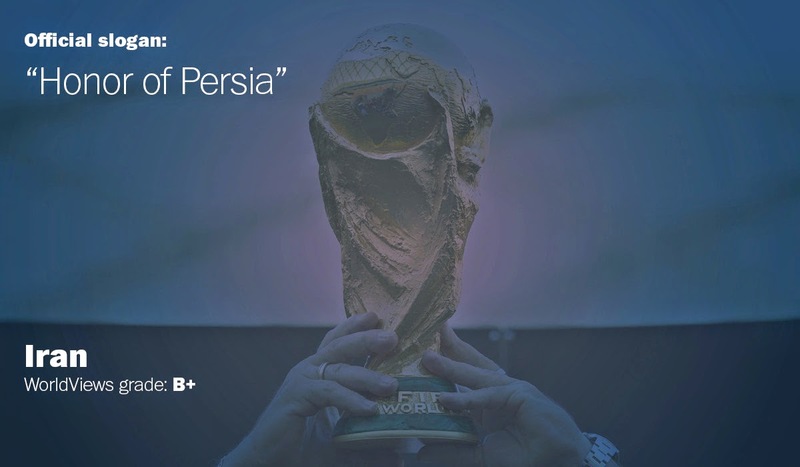 To learn more about Team Melli, its history and players, check out this rather good 12-minute video posted on FIFA’s online profile of Iran’s national team. May 21, 2014 - Ishaan Tharoor of The Washington Post has revealed (and rated) each of the 32 national team slogans for countries heading to the World Cup next month. Comments: Short and simple, the Iranian slogan does the trick. The Islamic republic's team achieves the rare feat of uniting both Iranians at home and in the diaspora, where many are staunchly opposed to the mullahs in charge in Tehran. Ahead of the World Cup, some of the Iranian squad have joined Twitter, even though the social media site is technically unavailable in their home country. 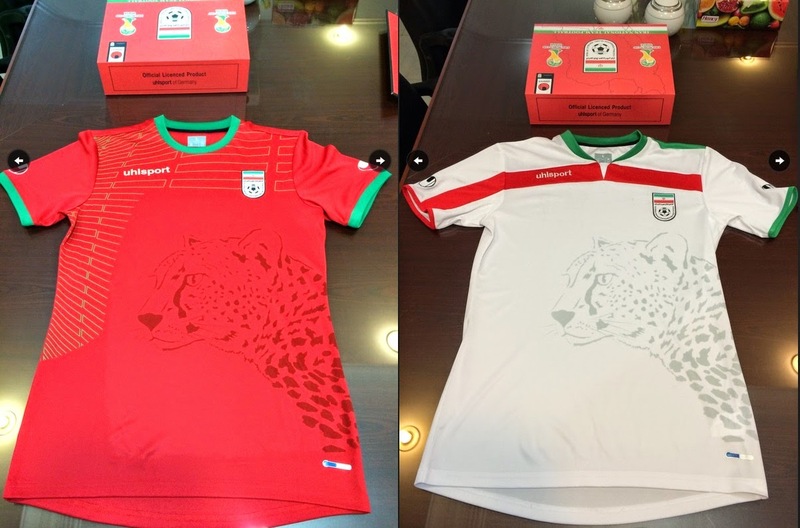 June 6, 2014 - It appears that the folks over at Mashable don't much like Team Melli's new jerseys. Having ranked all the competing teams' uniforms, and despite what they call a "a cool in-lay" of the Asiatic cheetah, Iran comes in last place. Weak, Mashable, weak.